The City of San Francisco is expanding its fleet of zero emission transit buses: After procuring 93 articulated Xcelsior XT60 electric buses, San Francisco Municipal Transit Agency (SFMTA) have placed an order for 185 New Flyer XT40 buses equipped with In Motion Charging (IMC) technology from Kiepe Electric – now one of the leading suppliers of traction systems for electric buses in the US. With In Motion Charging, trolley buses cover sections of route without overhead lines in battery-powered mode, with the batteries then being recharged when the vehicle is back under overhead lines. “We desperately need the new XT 40 electric trolley buses to improve the ride for passengers and the impacts on our environment. These new buses will serve passengers on the city’s hilliest and busiest routes. We can’t have them on our roads soon enough,” said SFMTA Board President London Breed. The contract concludes one of the largest zero emission bus procurement in North America to date. SFMTA’s trolley routes carry 200,000 riders a day through some of the city’s most dense neighborhoods. SFMTA operates these IMC buses on grades of over 22%, some of the steepest zero emission bus routes in the world. “The people of San Francisco deserve modern, reliable transportation services that support the quality of life and economic vitality of the city,” said SFMTA Director of Transportation Ed Reiskin. 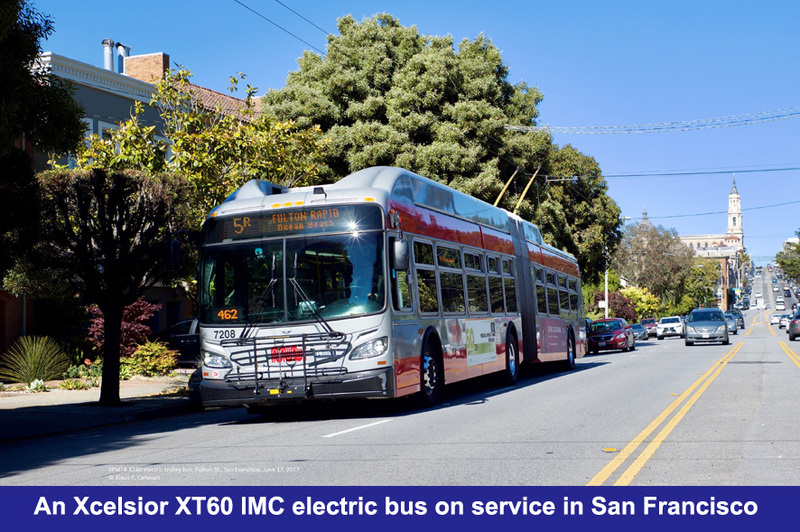 “By investing in new, high-performing, quiet and green electric trolley vehicles, we are able to provide better options for moving around the city.” Only recently, San Francisco placed their first option of 33 additional articulated XT60 IMC buses that are currently in production. To date, 452 Kiepe Electric IMC bus systems have been ordered by San Francisco and Seattle. Worldwide the battery-trolley combination has been ordered for 844 IMC buses already; 580 have been delivered and are in revenue service. Thus Kiepe Electric is an established international supplier of innovative electric transit bus systems.